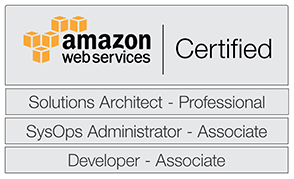 I’m happy to announce that this week I qualified as an AWS Certified Solutions Architect – Professional Level. This is significant qualification that validates that my knowledge and skills with the AWS platform meet their high professional standards. I offer independent AWS Consulting Services (prices here). Please contact us if we can help with your project.